For six decades the San Patricio Municipal Water District (SPMWD) has been an active participant in the process of seeking out additional water supplies for the Coastal Bend region. 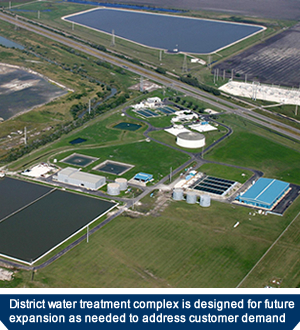 The district’s leadership benefits from the focus of a single mission and is in touch with the direct relationship between water and keeping industrial customers running. They have always recognized that a sufficient amount of good water must be available when needed. The District has worked with its regional partners and participated in state-sponsored regional water planning programs. On occasion it has explored water supply options on its own, particularly the investigation of brackish and fresh groundwater alternatives. This includes sustainable groundwater resources in Bee, Refugio and San Patricio counties that could be investigated further if needed in the future. The District has also pursued programs to use municipal wastewater as a replacement for river water in an innovative industrial application. When implemented these projects effectively increase the region’s overall water supply. In the 1990s growth in the district's eastern service area was forcing the District to run its system at maximum rates during summer months. New industrial customers were also coming on line. The District developed plans, negotiated contracts and by 1998 had started $39 million in expansion projects. A new round of planning began in the early 2000s. The need to replace an aging 24-inch treated water line became more imminent. Planners were projecting that a significant part of the regions future growth will come at the eastern end of the District's service area - Rockport, Aransas Pass, Ingleside and Mustang Island. The result was Project 2008, now under construction, that will increase District water treatment capacity and build new pipelines to better serve current and future needs. The history of water supply in our region is essentially an account of the region’s response to growth in the face of recurrent drought. Drought has always been the driving force. While the City of Corpus Christi took the early lead in securing water rights in the Nueces River Basin, the development of the reservoir system that facilitates the use of these rights has largely been a regional effort. The SPMWD and its customers have supported construction and improvement of the regional system and have agreed to pay their share through contract water purchases. The District and other regional customers played a key role in financing the construction of Lake Corpus Christi during the 1950s. Then it took a unified region in the 1970s to win federal authorization and financing needed to add Choke Canyon Reservoir to the system. South Texas drought cycles have underscored the peril of a single river basin supply system. The City of Corpus Christi, with strong regional support, led the entire state during the 1990s in planning for and acquiring future water supplies. The negotiation and execution of the Lake Texana water purchase contract, the financing and fast-track construction of the Mary Rhodes Pipeline System, and the acquisition of senior water rights from the Colorado River from the Garwood Irrigation Co. were all the outcomes of a remarkably effective regional partnership focused on identifying and developing future water supplies for the Coastal Bend region. Lake Texana, and later Garwood Water, provides water from the “wet” side of the wet-dry line that divides Texas. Cooperative regional efforts were successful in putting a diverse, multi-basin system in place. The long-term economic impact of a such dependable and affordable water supply on the stability of the region is very significant.